At the turn of the last century, Charleston’s private saltwater bathhouses could no longer (ahem) stay afloat as the price of upkeep and repair was cost-prohibitive. As we mentioned in Let's take a dip: Part 1, the City was supposed to take over the West End Bath House in 1903 and had plans to build two more for the use of the general public. It was with this hope that the Bathing House Commission was created. In the early 1900s, however, the Isle of Palms was coming into its own and while mayor after mayor appointed and reappointed members of the Bathing House Commission, it was a board without duties, for there were no bathing houses to supervise. Alas, the moribund Commission was revived and had duties for the first time in history in 1933. By this time, however, bathing had turned into swimming. Suits had be reduced to a more reasonable size, tans had become fashionable, and many of the youth had learned to swim at the YMCA or YWCA. The demand for a fantastic public swim facility was great, but the harbor waters had been discovered to be full of filth. The only answer, of course, was a public pool. Charlestonians first learned to swim at the YMCA and the YWCA. 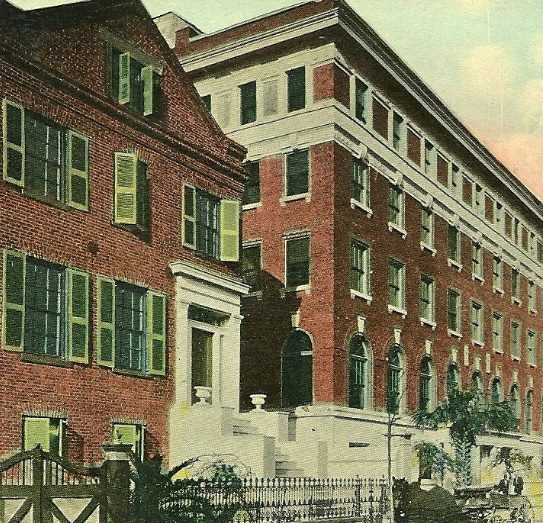 Charleston’s Young Men’s Christian Association was founded in 1854 and was housed a number of places around town until it built the grand building at 26 George Street, completed in 1913. It was just west of Meeting Street next to the High School of Charleston, where the College gym is now. According to a News & Courier article from January 22, 1913, the modern four-story brick building had a main gymnasium and two others, handball courts, a trampoline room, a track for running, and a large swimming pool. In addition, there were game rooms, lounges, reading rooms, and 61 dormitories. Up until the early 1950s, there was a no-trunks-allowed rule at the pool--according to Wikipedia, this was standard at all YMCAs from the 1890s until women were allowed admission in the 1960s. There were apparently concerns about cotton fibers from suits clogging the filters. Some of y’all out there (like Lois’ Daddy) surely remember those days! The facilities and location of the YMCA were proving to be outdated by 1970. The College of Charleston acquired the building in 1972 and used it as a classroom annex for a number of years and housed the art studios. In 1979, the old YMCA building officially closed its doors for good. The old Christian Family Y (formerly the YMCA) was across the street to the west, its property stretching through the block from 21 George to 76 Society Street. The last of those buildings, including the ‘new’ pool from 1962, were demolished a few years ago; XXI George Street, a luxury condominium complex was built on the site. An Evening Post article from January 13, 1933 announced that discussions were underway between state senator J.C. Long and Charleston’s mayor concerning the construction of a pool at Martin Park on Lee Street, near the foot of the Cooper River Bridge. (A pool would not be built at this site for another 40 years.) Mayor Burnet R. Maybank, who campaigned with the promise of a pool, announced instead three months later the plans to convert the old George Street water reservoir into Charleston’s first municipal pool. Oh, the joy! The Water Works Company (later the Commissions of Public Works) constructed the 3,000,000 gallon reservoir in 1880 behind the circa 1796 Middleton-Pinckney House at 14 George Street. Since the 53 year old brick and mortar structure only needed to be modified for its transformation to a swimming pool, the City saved a ton of money, according to an undated Post and Courier article, “Municipal Swimming Pool Built at Moderate Cost.” The pool was supplied with water from Goose Creek and artesian wells, which “fed into the pool through a concrete foundation in the center, which throws the water twelve or fifteen feet into the air and gives it a beautiful effect, especially at night.” The 193 x 131 foot pool had depths of 1-10 feet, three 3-foot diving boards and a 10-footer. The pool was divided into quadrants, with the diving boards on the northern side; in the southeastern quarter was “set aside for small children and the southeast quarter is devoted to grown-ups who cannot swim, the depth of this quarter being from three to five feet.” There were seven sets of concrete steps and at night the pool was lit by ten 600-watt lamps that were once used in Hampton Park. The pool was so large that at least four lifeguards were on duty at all times. The Red Cross taught swimming here, but it looks like most people were concerned with just having some fun! In 1945, the pool was named in honor of George Burges, a well-known local swimmer and former lifeguard at the pool who was killed in 1944 while flying a mission over Italy during World War II. 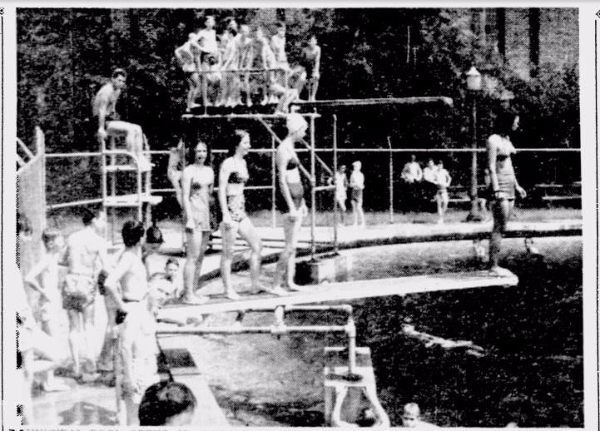 The pool nearly closed in 1962 because the wooden bath house was in such poor condition, but it remained open until a new pool appropriate for competitions was built in 1974 (at the Martin Park location mentioned above). 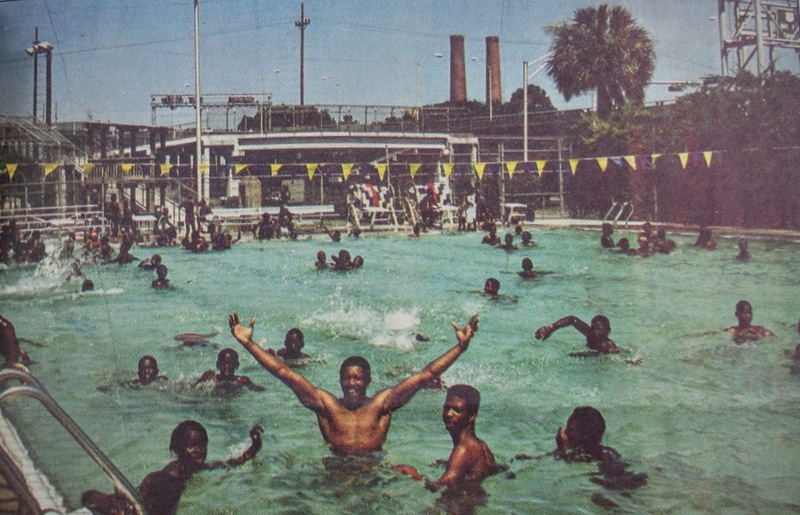 Throughout the late 1970s and 1980s, the drained pool was a favorite spot for local skateboarders, including Charleston’s own Shepard Fairey, the artist of last year’s several murals around town for Spoleto. The George Burges Municipal Pool was demolished in 1991 during the construction of townhomes on Menotti Lane. Y’all know that swimming pool up on the West Side, at Harmon Field, near the corner of Fishburne and President Streets? When do you think it was built? 1960s? 50s? How about 1933? Indeed, a December 6, 1933 article in the Evening Post described the pool as “the colored pool at Harmon Field”--this was the era of Jim Crow and the segregated South, after all. It featured water depths of 3-8 feet and was smaller than the George Burges pool at 105 x 45 feet. It was named after the grandson of a city policeman who was at Pearl Harbor during Japan’s surprise attack in 1941. A short time later, after seeing action at Guadalcanal, he was declared missing and then dead. He was the first black Charlestonian killed during the war. The pool has undergone extensive renovations over the years, the most recent of which included the construction of a new pool house. The award-winning building was moved to the west side of the pool to block the intense afternoon sun; now the pool can be seen from Fishburne Street. Some forty years after initially proposed, the municipal pool at Lee and Hanover Streets was completed and opened in June, 1974. While the Burges Pool was still used upon request from private groups for instructional purposes, the new one at Martin Park was expected to accommodate swimmers who formerly used the old pool on George Street. At 50 meters, the pool was designed to meet the needs of competitive teams and swimmers, and is still used for that purpose today. It is now covered during the winter to allow year-round use. Do y’all remember coming over from Mt. Pleasant and seeing this cool oasis from the old bridge? In addition to the two public pools downtown, there are options available in the surrounding areas. Check out the aquatics program in Charleston and if you’re really feeling adventurous, the County has three different water parks: Whirlin Waters at Wannamaker County Park in North Charleston, Splash Island at Palmetto Islands County Park in Mt. Pleasant, and Splash Zone at James Island County Park. Y’all go get your cool on! Looking for your own dipping spot? Lois has a couple of beautiful homes for sale with swimming pools, and she’d love you to come check them out and maybe dip a toe. Click below for full listing information and give her a call at 843-270-2797.